A large fire that started Wednesday near Santa Barbara, California, has continued to grow over the weekend, as winds and hot temperatures put firefighters in a tough position. Although California has become known for its devastating wildfires, the so-called Sherpa Fire is the first major fire to burn the Santa Barbara area in more than six decades. Photos of the Santa Barbara fire show the historic flames and the work that first responders are doing to calm them. By Saturday, the fire had grown to cover more than 7,000 acres in the highly agricultural region, bringing damage to crops of avocados, citrus, and olives. Fortunately, there had been very little damage to buildings. Officials declared a state of emergency on Friday, and residents were told to evacuate the area. The fire was expected to spread further on Sunday thanks to three-digit temperatures and "sundowner" winds. The strong offshore winds often occur late in the day and signal that even stronger Santa Ana winds aren't far away. Wind in the area has already made fighting the Sherpa Fire dangerous and unpredictable. 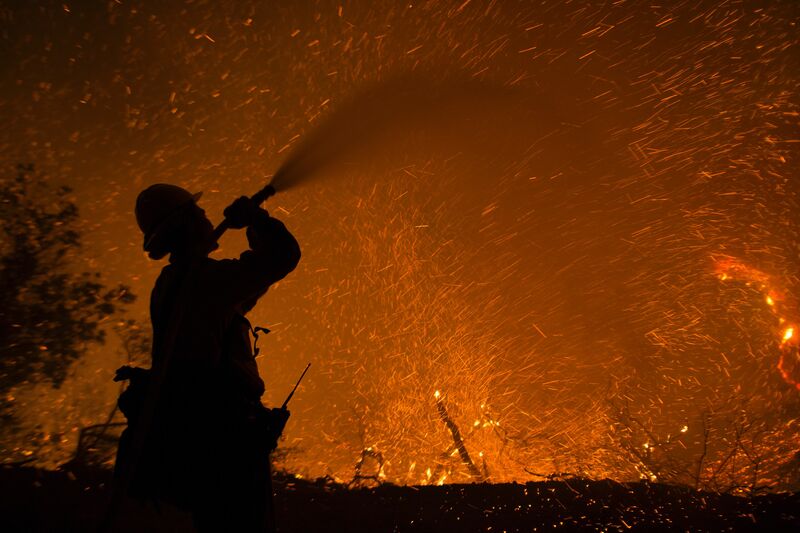 According to officials, the winds have reached 40 to 50 miles per hour at night, meaning that firefighters have had to endure tropical-storm level winds while battling the flames. In photos, that danger and level of difficulty is apparent. Some firefighters attacked flames from the air. Images show how expansive the affected area is. Others stayed on the ground, taking on the flames even as darkness set in. Firefighters worked, mostly successfully, to keep the flames away from buildings and roads. As the fire continued to burn across thousands of acres on Sunday, there were also thousands of firefighters on the job. Still, high temperatures in the region and unpredictable winds made the job tougher, and it wasn't clear how much longer the fire would burn. Temperatures weren't expected to cool until Tuesday, making it seem like the firefighting crews could have a long couple of days ahead of them.